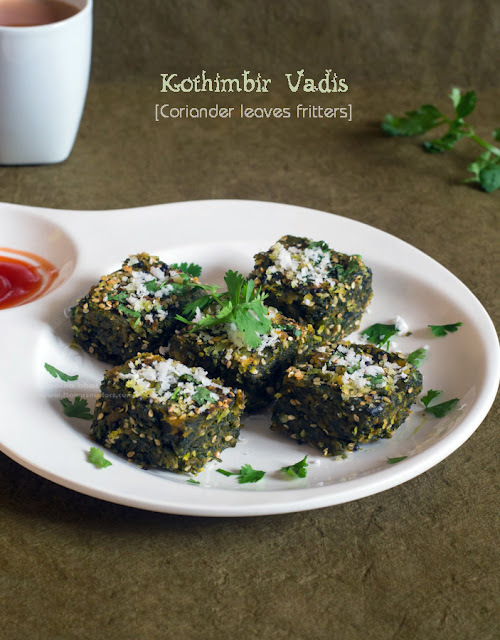 Kothimbir is marathi word for coriander leaves and Kothimbir vadis are crispy fritters in which coriander leaves remains the key ingredient. Traditionally, the recipe calls in for deep frying but here for health reasons they are shallow fried and served as teatime snack. Take enough water in a steamer/ pressure cooker [to be used without whistle] and keep it on the flame. Allow the water to boil. 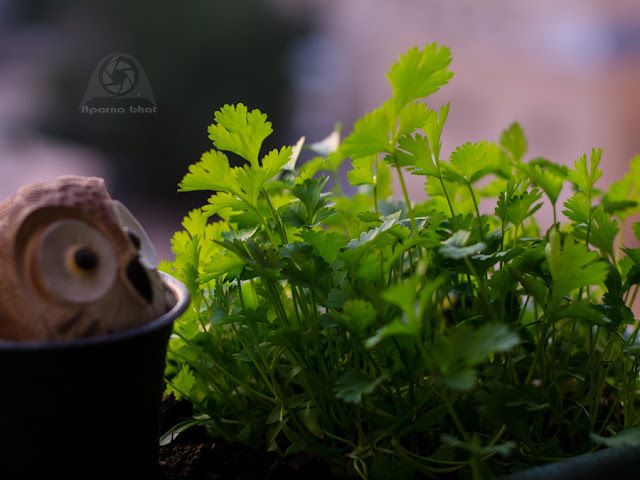 Meanwhile, in a bowl mix chopped coriander leaves with besan and rice flour. Add crushed green chili ginger mixture, chili powder, turmeric powder, cumin powder, soda, salt, sugar, sesame seeds, tamarind juice and oil. Mix everything well without using water. Then add water little at a time and mix it to make a lump free batter of medium/pouring consistency. Grease a plate/tray or steamer vessel. Pour the mixture upto 3/4th of the plate/tray height. Steam for 25-30 mins on high flame or till a knife/toothpick inserted in the centre comes out clean. Switch off the flame and allow it to cool. Cut into desired shapes [triangular, diamond or square]. You can deep fry these steamed vadis. Here I have shallow fried the vadis until light brown on both sides. For that heat oil in a pan, add mustard seeds. As the seeds splutter add white sesame seeds and hing. 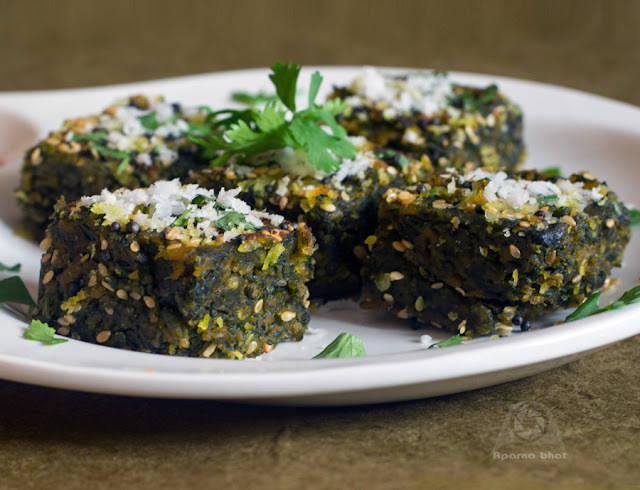 Add steamed kothimbir vadi pieces. Shallow fry until golden and crispy on both sides. Finally, add freshly scraped coconut over it. Mix well. 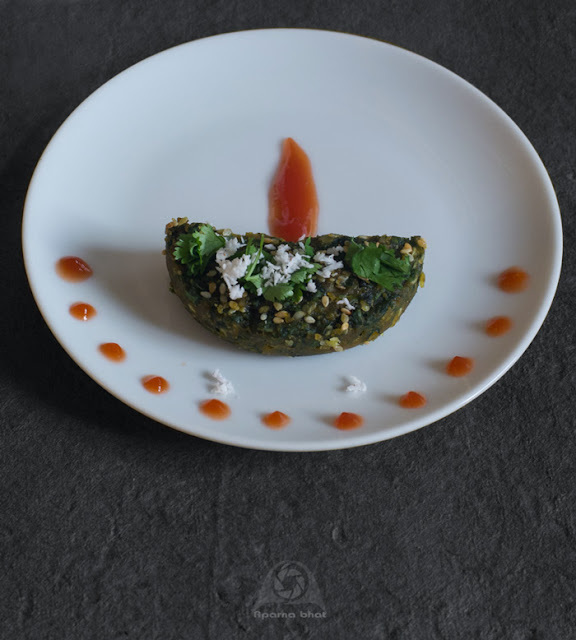 Garnish with scraped coconut and coriander leaves, and serve it as tea time snack with green chutney, tamarind chutney or tomato ketchup.